Should McCain supporters have hope or continue stocking up on canned goods? Should Obama supporters start fearing an electoral collapse or should they loosen up and enjoy an impending landslide? If you are trying to figure out what is what in these waning days of the seemingly never-ending presidential campaign, well, good luck. With five days until Election Day, there are signs the presidential race may be tightening, according to a new CNN poll of polls. According to an average of several recent surveys, Barack Obama's lead over John McCain is down to 5 points nationwide, 49-44 percent — a gap that is 3 points less than it was earlier this week, and nearly half what the margin was one week ago. With less than one week until Election Day, Barack Obama maintains a clear lead over John McCain in the presidential race, a new CBS News/New York Times poll suggests. The Democratic nominee now leads his Republican rival by 11 percentage points, 52 percent to 41 percent, among likely voters nationwide. A small percentage of these voters could still switch sides: The figures include both firm supporters of each candidate and those who lean towards one or the other but have not fully committed. These so-called leaners, however, make up less than 10 percent of each candidate's support, a sign that significant movement in the campaign's final days is not likely. Just five percent of the likely voters surveyed remain completely undecided. But, wha -- huh? How can two leading media polls be so far off, both in results and in interpretation? California's U.S. Senator Dianne Feinstein has made a very good (if belated) ad urging good Californians to oppose the anti-gay marriage referendum, Proposition 8. Good for her. It's about time. Now where's Gov. Schwarzenegger's ad? Hmmm? 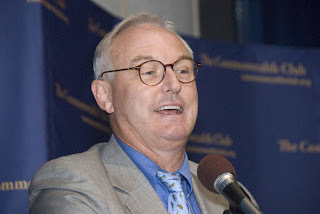 Christopher Buckley, the libertarian conservative satirist and author of such gems as The White House Mess and Thank You for Smoking, has announced that he's going to vote for Democratic Sen. Barack Obama for president. So what, you say? After all, so is everyone else. But the reason this is significant is not what Buckley himself declares in his blog posting to be the reason, namely that he is the son of William F. Buckley Jr., the man who resurrected conservatism in the United States. Actually, I think it's all the reasons Buckley includes in his posting (plus a few from fellow conservative David Brooks, who in the New York Times lambasts Sara Palin and the modern GOP as anti-intellectual populists who have sunk the party to its depths). Buckley explains his disenchantment with the new John McCain, who sold his soul and his authenticity so that he could sit atop a party now known mostly for its meanness and dimness.